Head out for a food trip on the food hub at the heart of my hometown. The area of U.P. Village and Teacher’s Village (both West and East), count in Sikatuna Village as well played a part in my life growing up. As for a good nine years, five out of the six in elementary and my entire four year high school life, these places I always go into during my school days in the area. Every time I come back, whether to visit my two Alma Mater schools (Headway School for Giftedness and Claret School of Quezon City), it is always a very special feeling for me. Three years have passed since I graduated from my humble high school Alma Mater in Claret School of Quezon. Yesterday, I returned to the area, and on the street of Maginhawa, and I can’t help but be happy with all the changes that has happened here since I roamed these areas on a regular basis back then. Maginhawa has become the food hub in my hometown of Quezon City as in a relative short amount of time, food and beverage establishments spawned up like hotcakes serving not only residents of the area, but also people from around the city and to an extent the metropolis to come here and dine over establishments offering a diverse line of food and drinks. I always remember when I was still in both grade school and high school, Maginhawa was just a simple street, with nothing more than residential housing and only a few food establishments were present in the area. Now, when I came back yesterday to roam around the area, I can’t help but notice the great changes that have happened here including the fact that Maginhawa is now a national road. Anyways, Maginhawa is indeed a gastronomic melting pot as for the entire stretch of the street, food and beverage establishments line up offering a variety of cuisines and specialties perfect for the next food trip. From burger joints like The Snack Shack which is known for their delicious “worth the wait” burgers at a very affordable price for everyone as you can get one for only P70.00. “Worth the wait” in a sense they make their patties on the spot and take around 15 minutes to cook to perfection. I recommend everyone to come and try out their delicious burgers. Another nice burger joint is Good Burgers which is well known for offering an alternative to the usual beef burger as they offer both vegetarian and chicken burgers with different toppings which customers can add to their burgers. Another one is The Burger Project where customers can customize their own burger by choosing ingredients to build the perfect burger for you. Other notable restaurants include Friuli Trattoria offering Italian favorites like pizza and pasta, Katsu Cafe offering Japanese dishes, Gayuma ni Maria which offers a unique experience for customers with their very mysterious interior accompanied with great food. Grill Queen which offers simple barbeque dishes, and Tomato Kick which is a resto-pub. Maginhawa is also home to many milk tea joints, the well-known Moonleaf Tea Shop made their humble start here as a small joint, now their flagship branch is now housed in a nice building not too far from their original location. Other milk tea joints include Cha Dao Tea Place, ZenTea, InfiniTea and Simple Line. This area has given me a lot of memories to treasure. Now, this area can bring me more memories with all the gastronomic experience this area brings to every one coming to it. The best part about it is that these are entrepreneurial success stories of the people behind food joints to which everyone who dine here are treated into, and along the stretch, you will not see your usual big name establishments like those serving fast food. 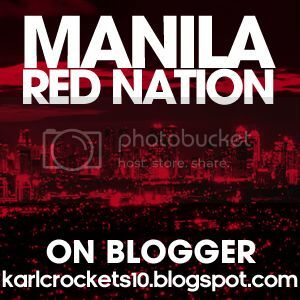 I am very excited and looking forward for my return to the area and the next food trip around these familiar grounds. For a unique and great gastronomic experience, you must visit Maginhawa. Back when the hood was young. 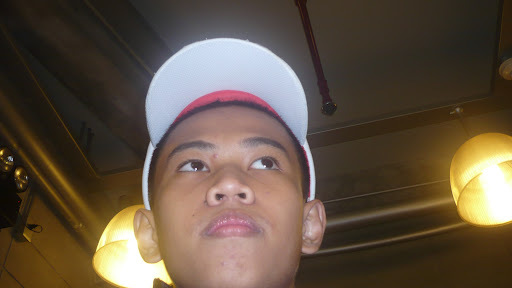 It was during the night of my little brother’s birthday. I decided to look back at the old photo albums from our childhood. From one photo album to another, I found some photos when we and my friends in the neighborhood were young kids. (DISCLAIMER: I can’t post these photos in public. They may kill me if I did. Haha.) These were great times, we played together outside our homes, played a lot of games from basketball to LEGO, among others. We even played in the rain. Back then, our home was one-storied, far smaller than our home today (still lies on the same spot as the old one) and admit it or not. I was one chubby dude. I remembered, I finished a whole pizza when I was 9 or 10 years old. I used to be a drummer boy (If I’d continue further, maybe I could have been a part of the UST Yellow Jackets today and would have cut my hair bald. Hehe). There were even photos of my neighborhood just when we moved the houses just being put up and look the same. 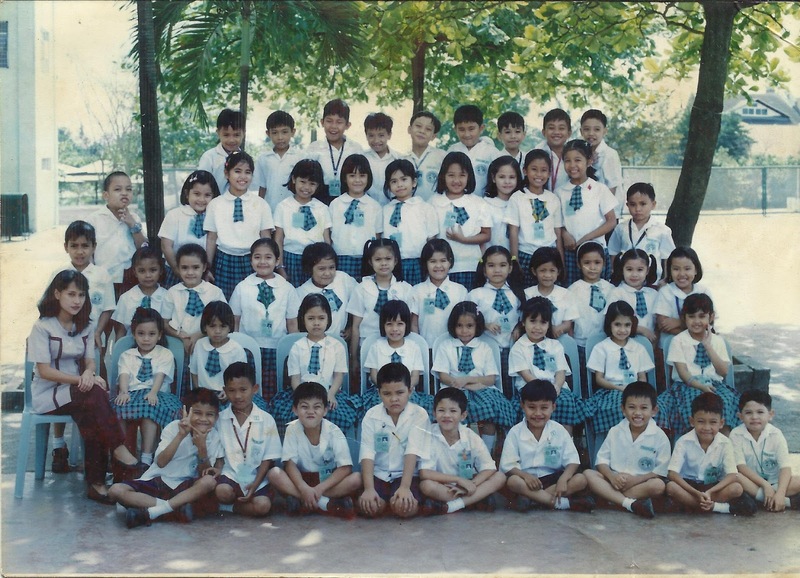 For now, I’ll keep on looking for those photos, if I can buy time looking out for these old photos. These were great memories. I forgot most of these things, but photos give me those flashback moments which make me remember what happened then. Looking back at those photos made me think of how far we have traveled and stepped up in our lives. It is true that a picture is really worth a thousand words. When I write something. I make sure that it will be all worth it. It has been three years already since my work got published on a newspaper. Well, I have two articles I wrote that got published. However, it was only now when I got to scan this article from the copy I kept for 2 years and put this on the web. Looking back, I can say this is one of the best moments of my entire life. It was “late” already for me when I joined the Tanglaw ng Claret back in 2009. I was on my final year of high school, and I thought joining the school paper could be something worth doing before I graduate from high school and add something to my credentials. A few months after joining the school paper. I was able to contribute two articles in one issue. 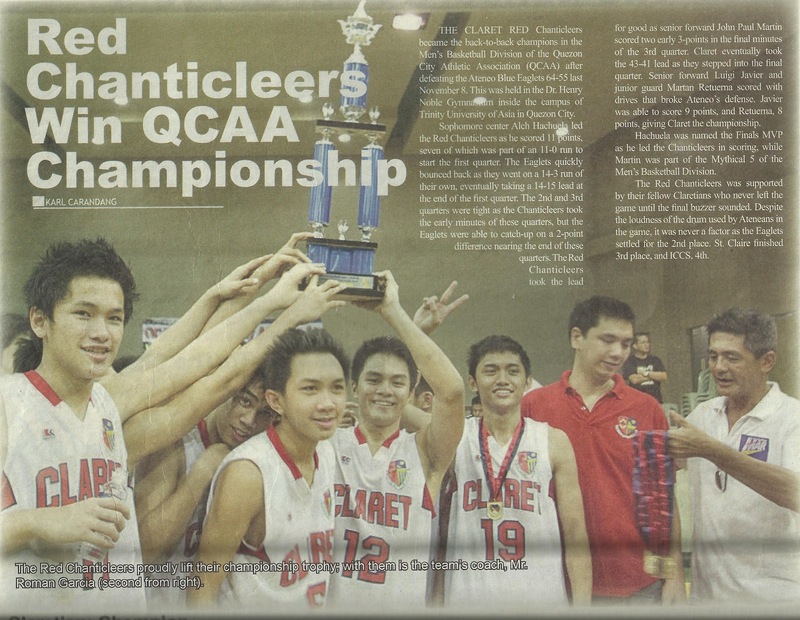 One of which I first wrote on my Multiply blog which was about Claret’s QCAA Championship Victory against Ateneo (NOTE: This is not the Ateneo Blue Eaglets who competes in the UAAP Juniors), which was later published along the issue. 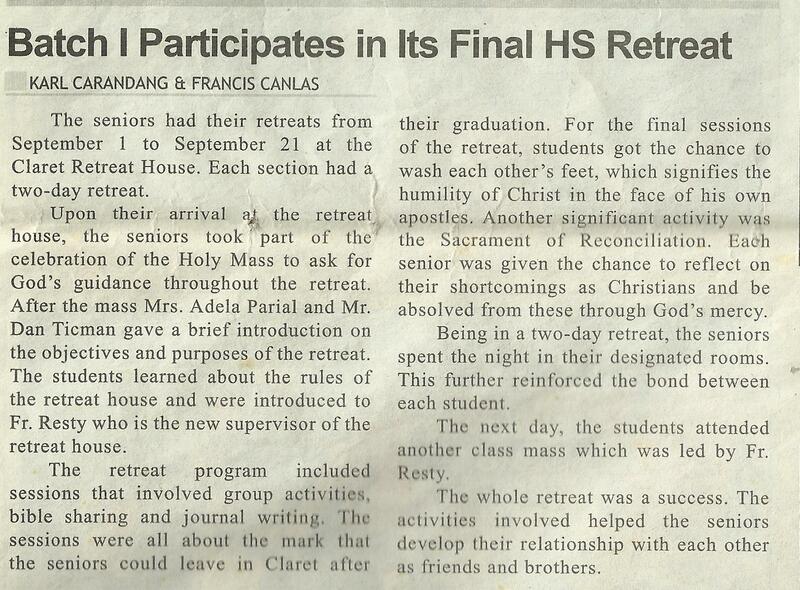 While the second article which was about the final retreat of our high school batch “Batch Invictus” and was also co-written by one of my MERALCO PEEPS in Francis Canlas. Getting my work published on paper is something I can be proud of in my life. Though my time in the school paper in high school was only short lasting from August 2009 until I graduated in March 2010. It was all worth the marbles. Writing is one of the things that I love to do in my life, fueled by inspiration. I’ll continue to write about things I love to share with the people around me for the rest of my lifetime. Back when I was (near) bald. It was the day before my birthday last April 30, I came by and stumble some photos on my Facebook wall featuring some of my classmates in college back in their high school days. Where they like the photos and make jokes out of it. 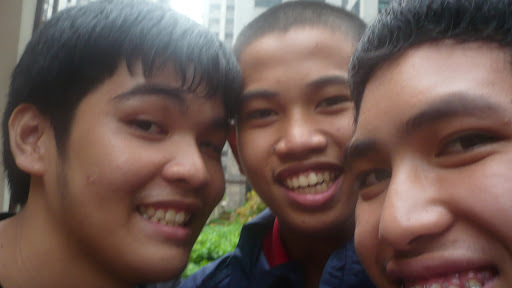 I joined the party by leaving comments on the photos, but later, they stumbled on my photos from back then, and found a picture of me when I was in high school sporting a “near” bald haircut which brought back memories of my fourth year high school which was one of the best years in my high school life. It was more than 2 years ago when I sported the look, in fact this was the first and only time in my life so far I sported this haircut. Well, there were haircut inspections back in high school and they were very strict on imposing it among the students (even in college there are haircut inspections but these are a little lighter than in high school). For me, I sported the haircut more on my personal choice, rather than complying with the haircut rule. I don’t like to sport longer hair for the fact that I don’t like bangs falling down from my hair (I know most would say What? You can brush that and raise it, and add some gel or wax on. ), but that’s my touch on hair, besides. I had some great memories with that hair starting from a birthday trip of my PEEP I attended together with my high school PEEPS, down at Eastwood City where we dined out at Yellow Cab, watched The Final Destination, went bowling, and chilled out the entire day. As well as the usual happenings down at school. It took about a couple of months for my hair to grow back from the time I sported the “near” bald look. Despite these facts that I can’t sport my cut, I can’t blame them for that. So from then on, I make sure I get the right haircut that I can be contented with. Besides, I have a good barber since the time they first brought me to a barber shop for haircuts and it costs me only P50 per cut (P20 for tips). Yes, he is a very good barber. Well, it may be odd to say this but sporting a “near” bald look was one of the best moments of my life. It was a time when I freely chose what haircut I will sport. Though it was for only a short time and it made me look like a odd person. It was all worth it.